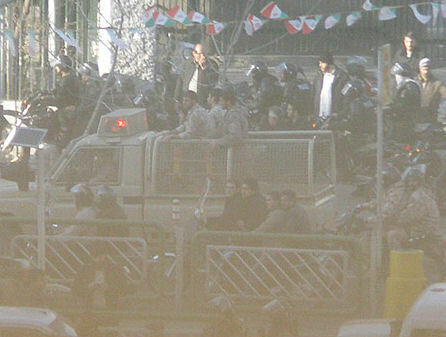 The opposition has announced its intention to demonstrate on 14 February 2011 (25 Bahman in the Iranian calendar). I'll be regularly updating this scrapbook to provide an overview of events and to give an idea of the mood in the country today. Please be advised that the times quoted reflect the moment that I became aware of an event or wrote it down, not necessarily the hour at which it occurred. I have tried to only post information and video clips which are credible. Although there is now a great volume of footage and photos showing extensive protests around Tehran (and other cities and towns in Iran), I have only posted those that appeared to be from today with a very high degree of certainty. One of the slogans of the day was 'Mubarak, Ben Ali, Nobateh Seyed Ali' (...Seyed Ali's turn) referring to the former presidents of Tunisia and Egypt, and Ayatollah Seyed Ali Khamenei. Other outlets such as Enduring America and Tehran Bureau will post what I expect to be more detailed live blogs in English. For more videos, here are a few very interesting YouTube channels: Unity4Iran, Freedom Messenger, Only Mehdi, Iran Students Committee...You can also check out more videos that I selected through my Twitter feed. I cannot remember demonstrators continuing their street protest into the late hours during previous rallies (perhaps an astute reader will correct me on this), but for whatever reason (calls to learn from the Egyptians and not relinquish the streets to security forces? 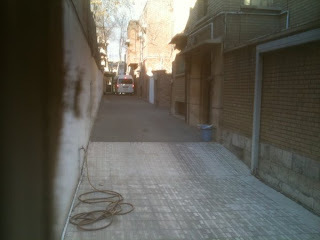 ), Iranians continued their protests as night fell. Here are a few videos purportedly from this evening. Demonstrators chant 'Independence, freedom, an Iranian Republic' -- a deliberate twist on the revolutionary slogan which ended with 'Islamic Republic' -- as a bonfire burns under a pedestrian bridge. I can conclusively identify where this next video, showing protesters chanting and burning garbage cans, was filmed. Towards the end we get a glimpse of Shahriar Hospital's sign. Cries of 'death to the dictator!' 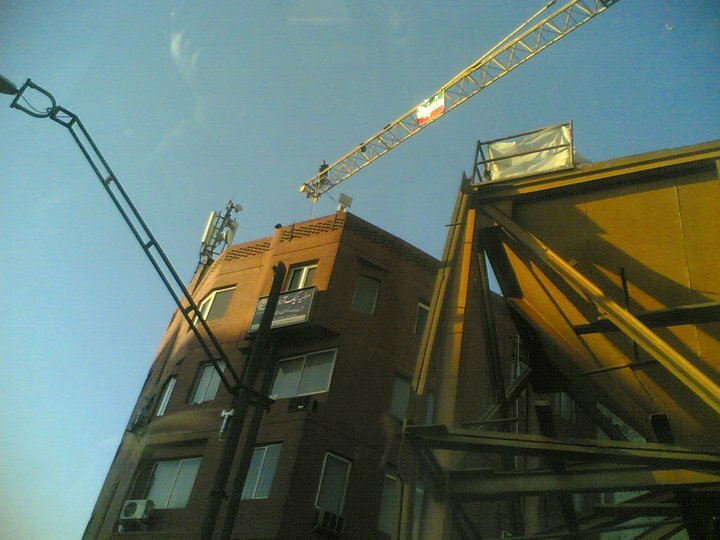 can be heard over the mobile phone of an eyewitness in a Tehran street. Another slogan I personally heard: 'Mobarak, Ben Ali. Nobateh Seyed Ali' (Mobarak, Ben Ali, now Seyed Ali [Khamenei's] turn.) I also heard: 'Nezami joda sho, ba mellat hamseda sho.' (Military separate [from the regime], join the people's voice). Another opposition news outlet hacked? Daneshjoo News appears to be down. Reports of large numbers of people coming out into the streets, but scattered for now. More reports of burning garbage cans from the Ferdowsi square area. Many Basijis around Enghelab Square. Roads have been closed off by security forces, but passengers are getting out of their cars and walking towards squares and roads around the Imam Hossein-Azadi axis. More reports of protests and clashes in Shiraz. Reports of demonstration in Enghelab Square. 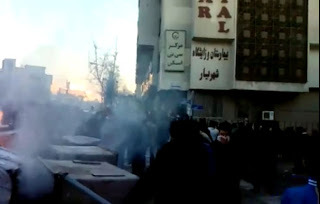 ePersian radio's reporter on the ground reports: Tear gas fired, protesters have lit garbage cans on fire, motorcycle-riding security forces, protesters beaten between Enghelab and Azadi squares. Protesters near Mollah Sadra and in Shiraz University. The opposition Saham News web site (Karroubi's outlet) was hacked, but is back online (see screen capture of Saham News homepage minutes before coming back online). The new cyber-police force in action? Update: I'm told the site is offline again. Some sources claim a sit-in is being organized in Imam Hossein square. Contradictory reports about the Interior Ministry having issued a permit for today's protest. Some serious outlets like BBC Persian have reported that the Interior Ministry has finally issued such a permit (some sources say this was done after the intercession of Turkey's President Gul who is visiting Iran today). The news is serious enough for IRNA to have reacted immediately with a denial from Deputy Interior Minister Mahmoud Abbaszadeh Meshkini, who accused the BBC of making trouble. Update: Foreign Ministry source claims permit was issued to appease Turkish President Gul, but some security outlets are denying this in order to dissuade people from demonstrating, a caller tells ePersian radio. ePersian radio: The usual coterie of regime supporters are phoning the call-in program to insult host Saeed Ghaem Maghami. Ghaem Maghami responds by saying to one of them, 'You may hate me, but I love you, sister, and I'll definitely see you in Tehran.' 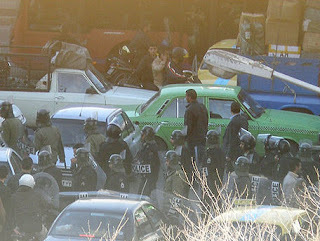 Callers report disturbances in Naziabad district, Azadi Square, and Sadeghiyeh. - The state TV web site is still down, apparently the victim of a denial of service attack. The hacker group Anonymous had announced it would wage such attacks in a video released late last week. - In an attempt to keep people from demonstrating, the government has told civil servants that they can benefit from overtime by staying at their desks until 6PM today. Reports of people massing in Tehran's Sadeghiyeh district, north of Azadi Square. Earlier today (8:30AM Tehran time), a protester climbed a crane near Chahar Raheh Ghasr, hoisted flags, and held up photos of 'martyrs.' He/she threatened to jump off if security forces attempted to apprehend him/her. Gone are the days when we used to cry over missed episodes of our favorite programs on traditional devices of entertainment because specific time slots of TV channels. Moreover re-run and boring episodes are no longer abused as a waste of time and effort. And once you missed the episode it is difficult to catch the pace of program. Markazi Tv. has filled our sky of overburdened life with the colors of infotainment rainbow. Now entertainment lovers do not bother to miss their favorite program as online TV channels offer them to access back dated episodes with an ease of time. Ever availability of online channels has increased the reliability of TV online as compared classical TV even at workplaces watching online tv channel is a viable option.